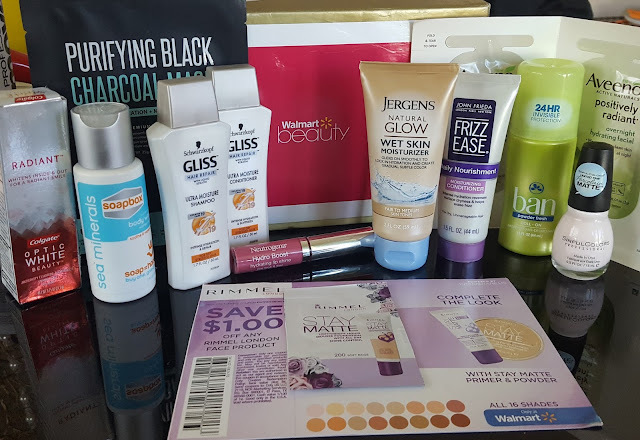 A couple of months ago Walmart Beauty reached out to some of their beauty box subscribers via email asking if they'd like to take advantage of a limited edition box in lieu of the normal Spring beauty box. This "Me Moment" box, a collaboration with Canada Dry and Southern Living magazine, is geared toward taking a break from life's busy schedules and responsibilities and giving yourself a little "Me" time. Boxes started shipping in April and mine finally arrived in mid-May. I was blown away by the amount of stuff in this box! What: Walmart Beauty Box contains samples of beauty products from major drugstore brands. This review is for the limited edition Me Moment Box. Schwarzkopf Gliss Hair Repair Ultra Moisture Shampoo and Conditioner - This shampoo/conditioner duo is made for dry, stressed hair prone to breakage. It's infused with a Liquid Keratin complex consisting of 19 ingredients to reduce hair breakage by up to 85%. To tell you the truth, I'm not very picky about my shampoos and conditioners at all; as long as it smells nice I'll use it. And this smells good. I'm game. Soapbox Sea Minerals Body Wash - This also smells good, and I knew it before even opening the bottle. How? Because half of it had spilled in the box in transit. And it's really still a mystery how that happened because the bottle was capped tightly. Must be a pressure thing. Anyway, I must not be very observant because I had no idea Walmart carries Soapbox. I love their cause - every bottle you buy gives a bar of soap to a town in need - and you can track just what town you're helping out! This body wash contains sea minerals which is a natural detoxifier as well as a shea butter and aloe blend for maximum hydration. 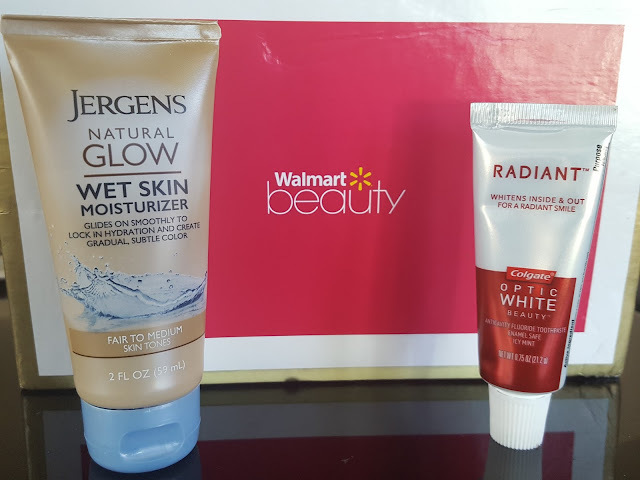 Jergens Natural Glow Wet Skin Moisturizer (for Fair to Medium Skin Tones) - I guess this can be called a self-tanner since it's supposed to give your skin a gradual glow with daily use. You use it when showering and apply it to wet skin to create gradual, subtle color. Bonus: it also doubles as a moisturizer. DHA, the primary coloring agent in tanners, is the sixth ingredient down on the list in here compared to it being second or third in other self-tanners. I've actually tried this before and it didn't work whatsoever even after two weeks' use, and my skin tone is on the medium side. Maybe it might work for lighter skin tones. Colgate Optic White Beauty Radiant Toothpaste - *sigh* whitening toothpastes. I've given them lots of tries, but sorry I'm still not a believer. Three brands and five toothpastes later and my teeth aren't a single shade whiter than they were before. The whitening ingredient in here is hydrogen peroxide so if you have sensitive teeth or gums you may want to exercise caution when using this one. 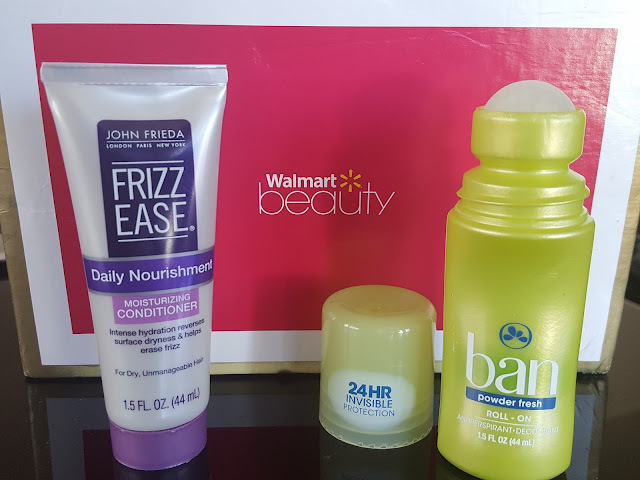 John Frieda Frizz Ease Daily Nourishment Moisturizing Conditioner - I have mixed feelings about the Frizz Ease line. I have the 3-day straightening spray and the smoothing creme and sometimes they work, sometimes not. It really depends on how stubborn my hair is feeling that day. I live where it's humid so if there's a lot of moisture in the air the frizz will beat out anti-frizz products. But I am still on the hunt for a smoothing conditioner that actually works, so I'll give this a shot. Ban Powder Fresh Roll-on Deodorant - Call me old school, but I've never owned a roll-on deodorant before. I do like roll-on perfumes because you avoid the perfume overload problem; maybe deodorants are the same way? Not that I've had a problem with applying too much deodorant or anything, but if it'll prevent the yucky white residue of solids or the alarming rate at which gels go down, I'll gladly jump on the roll-on wagon. Sinful Colors Nail Polish in Mad Matter - Is it crazy that I have five bottles of light pink polish in almost this exact shade? They're all a teensy bit different, of course, but I'm so nit-picky with my light pinks and light blues that I have to keep all of them because WHAT IF I WANT ONE A QUARTER SHADE DARKER THE NEXT TIME??! Neutrogena Hydro Boost Hydrating Lip Shine in Radiant Rose - Is it also insane that the same problem I have with pink and blue nail polishes applies to pink lip glosses as well? Well, I don't have a bajillion shades of medium pink, but I can't give up ANY pink lip gloss. So that means my lip gloss collection spans the entire gamut of pinks. Welcome to your new home, Radiant Rose. 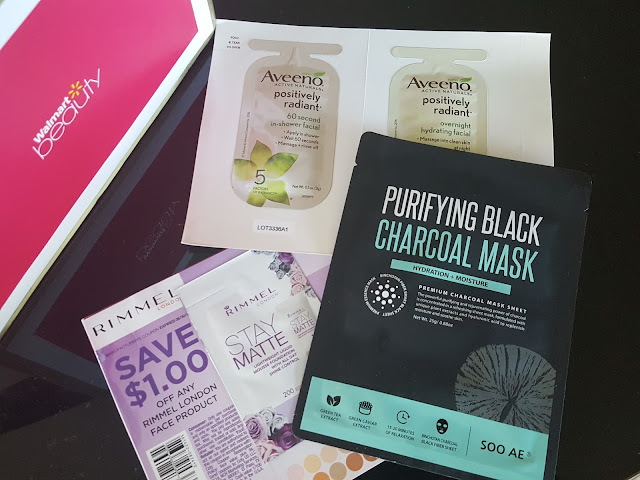 Soo Ae Purifying Black Charcoal Mask - It's not very often that you see Korean brands at Walmart (this one is distributed in the US), but if this is a hint at the direction that Walmart's beauty department is going in, I won't complain. This mask is formulated with Korean binchotan charcoal, green tea extract, and caviar extract and is designed to detoxify, brighten, and hydrate your skin. 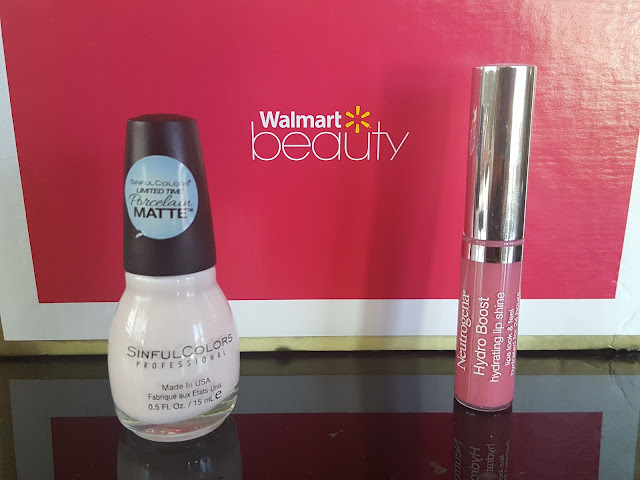 Walmart beauty boxes usually also have a few sample foils as well. The Me Moment box has samples of Aveeno Positively Radiant face wash and moisturizer, and a singlue-use sample of Rimmel's Stay Matte liquid foundation. Verdict: I've always had an overall positive opinion of Walmart's beauty boxes because I've found several budget-friendly favorites through this box. 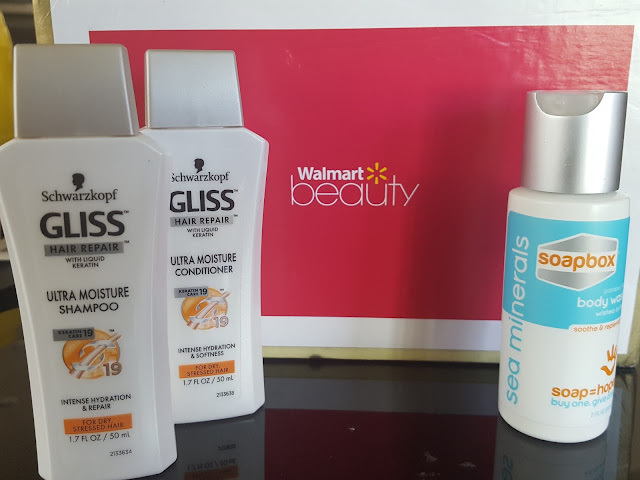 But over the last year or so I felt the Walmart beauty boxes had been making a steady decline in terms of product variation, and I had been seeing a lot of repeat products. To my surprise (and delight!) this was a box of redemption. I'm very impressed with the value (I didn't list them down in this post but I calculated a value of about $22 for this box) and variety. There's more than just shampoo, body wash, and lotion in here - there's also dental care, cosmetics, and even a deodorant. Not to mention three of them were full-sized products - something I haven't seen for a while in the Walmart boxes. So an a nutshell - Great Job, Walmart (and Southern Living and Canada Dry)! Click here to get started on your own subscription to Walmart Beauty Box. I believe summer boxes may start shipping next month.